At Bradford City Academy there has been significant developments in the recruitment process in the recent years, as Bradford City continues to recruit young players with great potential to enter our Academy and works towards becoming part of the first team squad. Bradford City Academy have a network of scouts covering the surrounding areas, they are always on the lookout for talented young footballers who have the determination and drive to become great footballers. 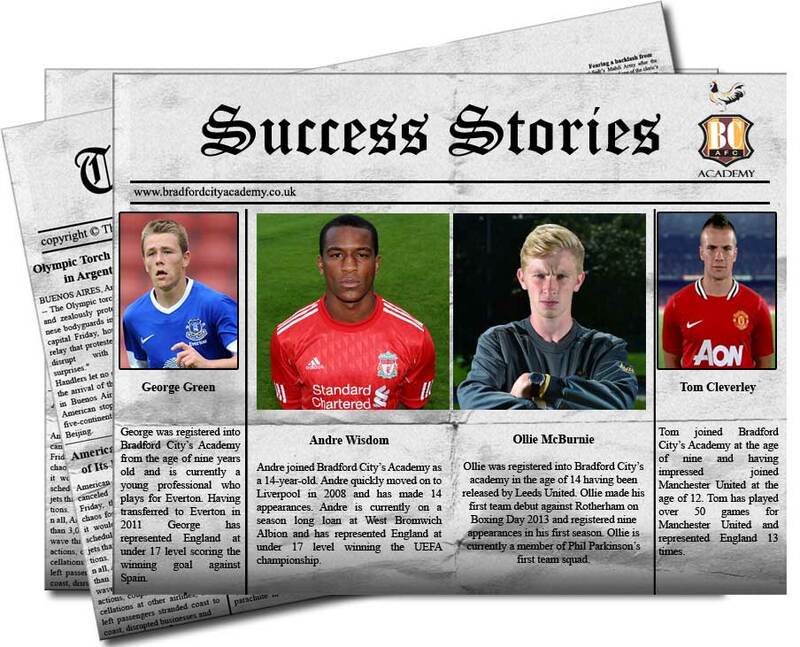 At Bradford City we are devoted to selecting out potential future young players as soon as possible. This is accomplished by identifying and recruiting talented footballers aged 6/7/8 from grass roots clubs, school football and recommendations. Our scouts play a vital role in selecting and putting forward the players to the Development Centres. Once the player has enrolled into one of our Development Centres, they are entered into a structured programme that is aimed at bringing out there full potential, while giving them the enjoyment of playing football as part of a recognised Development Centre. The development centre is a pathway into the Academies Elite Centre, but this does not mean guaranteed entry, however we are confident every player will benefit from there time spent in the Development Centres, with a improved vision of the game, along with nurturing there playing abilities. The Elite Centre is based at Woodhouse Grove, along with all first team and academy activities. The centre is an excellent place for those “Elite” boys to improve and develop their ability with opportunities for the U9’s to make the step up to the Academy. The younger players began to develop relationships with fellow players whilst getting a feel for the environment and coaches, all who work within the academy. Scouting continues at all age groups, we are always looking for potential players to join our Academy. Similar to the Development Centre, the scouts are attempting to identify players who have the potential and ability to become great football players.